Helmet with speakers are the most loved bike accessory around the world. A helmet plays the most important part while riding a bike and if it is attached with speakers than you can enjoy your journey. The Helmet is designed in such a way that it pleasures your ear and maintain a perfect volume. This unique helmet can be used with any bike. It is padded with high-quality pads inside the helmet to give the user a nice and smooth feel while riding. The soft, padded speakers attach to the inside of your helmet by hook and loop fasteners pads (included), have a volume controller as well as a microphone which make you more comfortable to use. The LX-T2, Designed to keep you connected to rider over longer distances for voice conversations with an 800 meter (nearly 1/2 mile) range. With our new, high performance speakers and Bluetooth v3.0 connectivity, enjoy crystal clear audio for listening to music, audio navigation, or hands-free telephone conversations when connected to a Bluetooth capable device or mobile phone. This new communicator also comes standard with both a boom microphone or button style microphone to make mounting easier in more types of helmets. The buttons are large and easy to feel, even when wearing gloves. 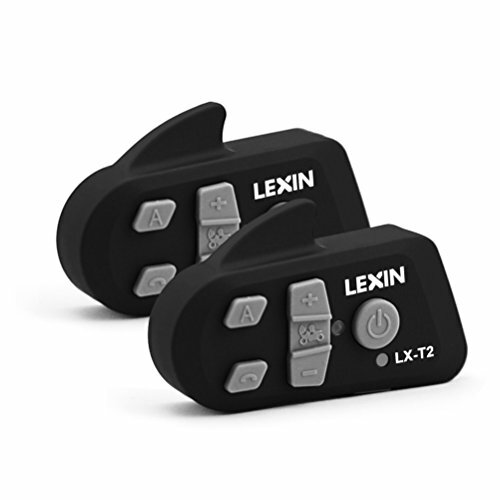 The LEXIN LX-T2 is a Bluetooth v3.0 Class 1 Stereo Headset with long-range Bluetooth Intercom designed specifically for motorcycles. With the LX-T2, you can call hands-free on your Bluetooth mobile phone, listen to stereo music or voice instructions of Bluetooth enabled GPS navigation units wirelessly, and have intercom conversations in full duplex with a passenger or another motorcycle rider. Thanks to Bluetooth v3.0 and advanced noise cancellation technology, the LX-T2 offers the best audio quality for both incoming and outgoing sound in its class. The LX-T2 can connect to other Bluetooth devices supporting HSP/HFP (Headset Profile/Hands Free Profile) and A2DP (Advance Audio Distribution Profile). HSP/HFP is standard in all phones with Bluetooth features. Almost all Bluetooth MP3 players, smartphones, and audio dongles support A2DP to send stereo audio to Bluetooth headsets like the LEXIN LX-T2. NEW Ultra-Clear, proprietary, advanced noise cancellation technology removes wind noise for crystal clear communications, even above 120KPH (75 MPH). NEW high-performance speakers provide louder volume than ever before, and mount easily in most full face and open face helmets. NEW microphones – allows you the choice between a boom microphone for open face or flip-face (convertible) helmets, or a button microphone for full face helmets. Bluetooth v3.0 connectivity to listen to music, receive turn-by-turn voice navigation, and make/receive calls via Headset Profile (HFP), Hands-Free Profile (HFP) and Advanced Audio Distribution Profile (A2DP). Full duplex rider-to-rider communication with a range of 800 meters (nearly 1/2 mile). If you have any doubts about this Helmet speaker, you can post a comment below, we try to solve the user queries as soon as possible.